“Unlimited Hosting” you must have come across with this term, right? Yes, I know because this term is often used in the web hosting industry by the providers to attract the customers. If you are one of those who are planning to host unlimited websites, then this article is for you. I will highlight the two providers that offer the best unlimited web hosting plans that you can have a look at, before buying the same. In unlimited hosting, you get a chance to host unlimited websites or domains. You don’t have to worry about unexpected traffic on the website and it also saves your money by allowing you to manage the domains and websites. You will get many providers in the market that offers unlimited web hosting service, but it becomes difficult to judge them, therefore it is suggested to check the terms and conditions of unlimited web hosting plan determined by the provider. The MilesWeb Unlimited plans are starting from Economy – Rs. 99/mo, followed by Value -Rs.204.30/mo and Unlimited – Rs. 312/mo. Moreover, you will get a coupon code on the Value and Unlimited plan of web hosting. You get a support service for 24*7*365 days and you can communicate with them via chat, email and phone. In terms of uptime, you will get maximum uptime of 99.95% because of their Tier – 3 and Tier – 4 datacenters that are located in the UK, USA and India. What if you are unhappy with MilesWeb service, then you can ask for a refund as they provide 30 days money back guarantee service. Just make sure that you have read all the terms and conditions of the MilesWeb refund policy. It does not end here, there is something more you should know about them and that is they are India’s first web hosting provider that offer Amazon Cloud platform for all their hosting services. Features offered by MilesWeb are Amazon cloud platform, free domain, free SSL certificate, unlimited bandwidth, SSD Disk space, email accounts, cPanel, free website migration, LiteSpeed web server, Cloudflare CDN, instant chat response, support in English, Hindi and Marathi, free website builder,etc. They also provide add-ons apart from hosting such as website backup, dedicated IP, SpamExperts, Sitelock basic, Google webmaster and analytics integration at a decent price. HostPapa is one of the best web hosting companies in hosting industry that aims to serve a reliable and satisfied web hosting service at a decent price. Their product range is huge as it consists of products and services like web hosting, domain, VPS, Reseller, WordPress, CMS, eCommerce hosting, etc. You can buy any product and service as per your requirement. Their unlimited web hosting plan is starting from Starter – Rs.199/mo and continued by Business – Rs.199/mo and Business Pro – Rs.699/mo. You get attractive discounts on all plans of their web hosting. You can convey your query via chat, email and phone as they are available 24*7*365 days to serve you. They guarantee to provide 99.9% uptime with their plans and their servers are located all over the world, but some of them, I would like to mention that are India, UK and USA. If you are not satisfied with their service then you can ask for the refund anytime because they offer 30 days money back guarantee feature. You only need to monitor their refund policy before asking for a refund. Features offered by Hostpapa are free website transfer, free Cloudflare CDN, free SSL Certificate, cPanel, CloudLinux servers, starter website builder. Their advance features contain unlimited add-on domains, email accounts, MySQL databases, etc. Both the providers offer the best features, but someone has to win the race, right? In this paragraph, you will get a detailed comparison between the providers. Price: MilesWeb is ahead since their plans are quite affordable in comparison to HostPapa. Features: Both the providers offer the same features, but MilesWeb is the winner since it offers some extra features in comparison to HostPapa. Those features are Amazon cloud platform, support in local language (Hindi, English and Marathi), SSD Servers, etc. Uptime: In terms of uptime, you will get maximum uptime of 99.95% by MilesWeb. Whereas, HostPapa gives 99.9% uptime. You may think this is a slight difference, but it matters a lot for keeping your website live. 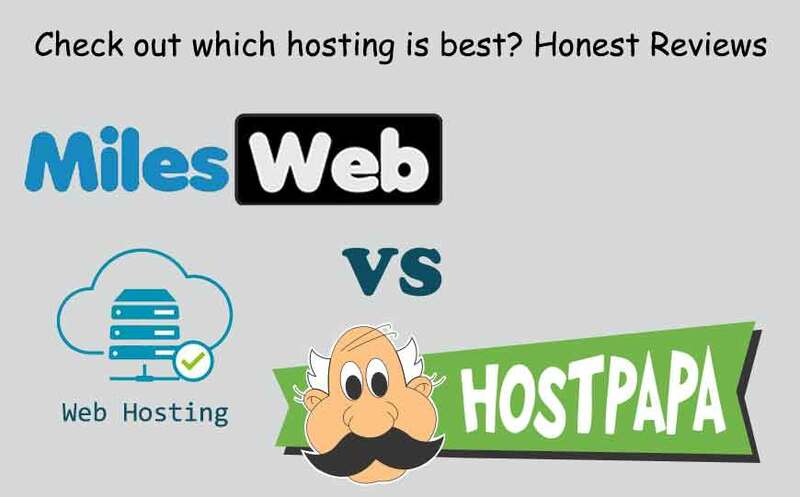 When it comes to deciding between MilesWeb Vs HostPapa then the decision will be tough for you because of similarity in the features. But MilesWeb is leading the comparison as it can be the first choice for you in terms of unlimited hosting provider in India. At last, it’s your decision which provider you choose to host unlimited domains.